New construction in Boston has been undeniably busy as of late with new projects popping up across the board. One of the most ambitious of all the proposals is set to be constructed on the waterfront site where the old New Boston Generating Station used to sit. If completed in its original form, the development could have been the biggest single development that South Boston has ever had (excluding Seaport). But not everyone is on board with the plans, and developers may need to think just a tiny bit smaller. Learn more about the property and why, even with the opposition, it’s still going to be a huge undertaking for all those involved. 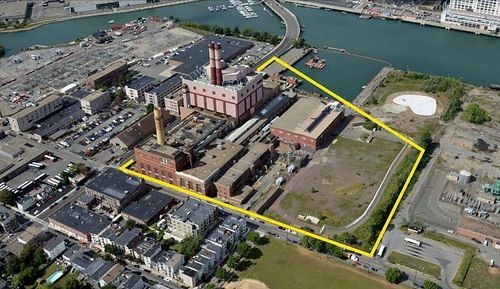 The developers on this project are Hilco Global and Redgate, and their plans are to turn the 15.2-acre site into South Boston apartments, condos, retail, and commercial businesses. As if that weren’t enough, they’re also planning to add on a 150-room hotel. The whole thing is slated to be 2.1 million square feet, with a total of seven new buildings. Three of those buildings are likely to be more than 200 feet high. There will be 1,588 apartment/condo units, 339,000 square feet of commercial space, and 68,000 square feet of retail space. The property will also include an underground parking area with just under 1,000 spaces. Finally, there will be a new road developed just off Summer Street to facilitate transportation and a 1.15-acre plaza running along the Reserved Channel. Even people who are poor at estimating square feet question whether or not this kind of development is really feasible in South Boston. The New Boston Generating Station (South Boston Edison Power Plant) has been closed for quite some time. Practically everyone agrees that the site needs to be cleaned up for the sake of the city and for those who live near the abandoned waterfront property. But neighbors aren’t convinced that the area can handle this type of activity. They may want change, but not necessarily in this way. Nearby residents are questioning whether this end of the city even needs all the additional retail and hospitality. If the demand doesn’t fit the supply, it may not be long before the development turns into a mess of empty space with ‘For Rent’ signs everywhere you turn. Residents are requesting a more practical approach to building that takes into account both the needs of the general area and the desires of those who live closest to the property. State Rep Nick Collins has voiced his own concerns about the South Boston new construction, essentially pointing out that developers are trying to fit far too much action in too little of a space. How will the area handle the 10,000 to 20,000 vehicles a day needed to turn this project into a reality? So far, those answers are still forthcoming. Recent official forums from both elected officials and residents suggest that there will be some alterations to scale back the plans soon. However, even if the project is pushed back, there’s no denying that it will still be a massive undertaking. The addition of South Boston luxury apartments, shops, and restaurants can all help revitalize an area that was previously nothing more than an eyesore. There have been no official changes to the plans, but it is still under review. No matter what happens though, the project isn’t expected to be completed until 2030, so at least developers have a few years to get it right.